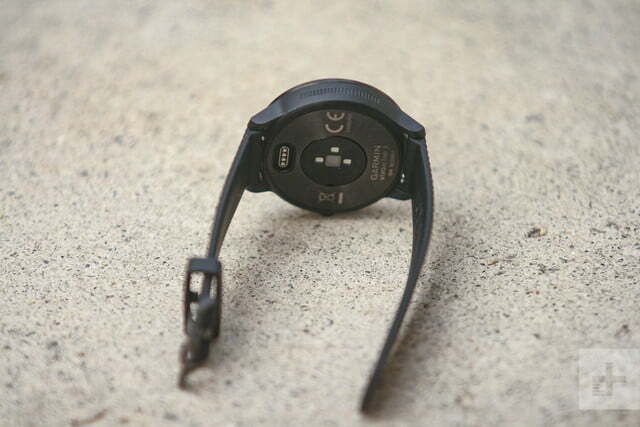 A weak vibration alert cripples the otherwise powerful Garmin Vivoactive 3. Garmin’s fitness bands have almost always been large, even massive, smartwatches. In fact, we nicknamed them BBWs — or big, burly, watches. With the new Vivoactive 3, Garmin left the big behind and delivered a GPS multisport smartwatch that’s smaller, more refined, and a nice reminder that watches don’t have to be big and burly to deliver the goods. We’re happy to see that after a short design detour with the square Vivoactive HR, Garmin returned to the realm of minimalist watch design with the round-faced Vivoactive 3. The watch is 1.75 inches in diameter, a little less than half an inch thick, and weighs only 43 grams. It’s water resistant to 5 ATMs and features just one button. 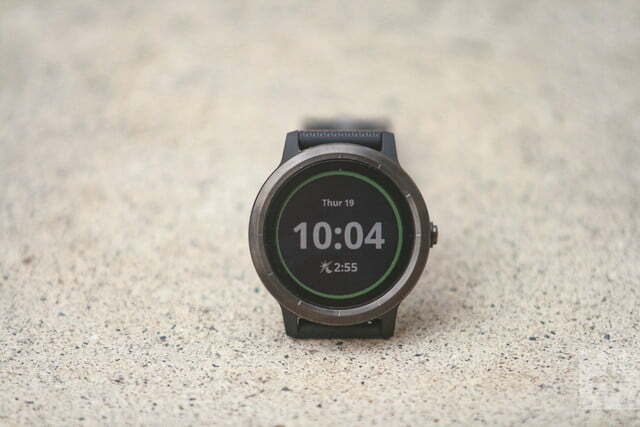 The Vivoactive 3’s bright 1.2-inch color 240 x 240 pixel LCD touchscreen, Gorilla Glass 3 lens, and polymer case with stainless steel bezel leave it looking more like a Garmin Fenix 5 junior than a member of the company’s Vivo fitness band family. Which isn’t terribly far from the truth, especially when it comes to onboard tech. The Vivoactive 3 packs in a full set of sensors including GPS (and GLOSNASS), a wrist based optical heart rate monitor, barometric altimeter, compass, accelerometer, and thermometer. It is capable of tracking daily fitness metrics like steps, stairs climbed, calories burned, distance travelled, intensity minutes, and sleep time and quality. A real-time “stress meter” measures heart rate variability and helps users eliminate that stress by delivering a paced relaxation breathing session right on the watch. When connected to a smartphone via Bluetooth, the Vivofit 3 delivers full smart notifications with a vibration alert. Like its predecessor the Vivoactive HR, the Vivoactive 3 comes loaded with 15 trackable activities including walking, running, swimming, cycling, snowboarding, skiing, stand-up paddling, and more. It also estimates VO2 max and fitness age. After a detour with the Vivoactive HR, Garmin returned to attractive, minimalist design with the Vivoactive 3. Using ANT+, the Vivoactive 3 can communicate with heart rate monitor chest straps, cycling speed and cadence sensors, and the Garmin foot pod for runners. 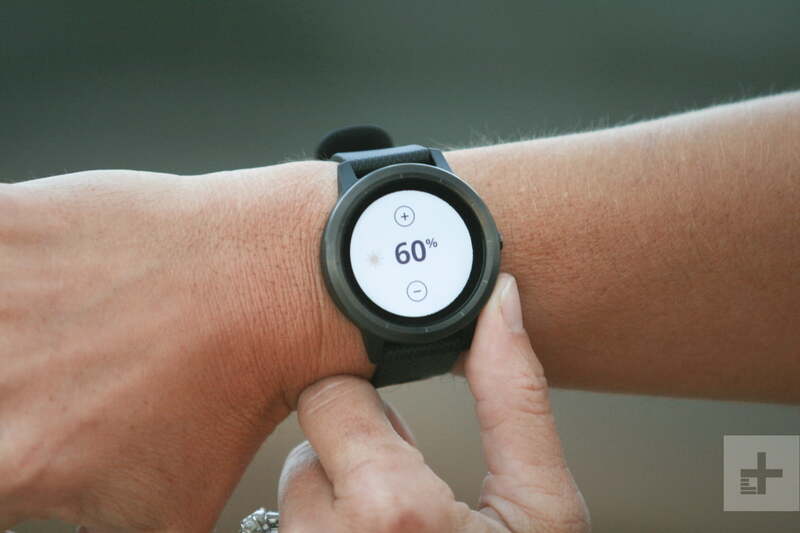 It also tracks a round of golf, logging shots and scores, the distance to the front, back, and middle of the green, and keeps a running tally of strokes and putts per round, as well as greens and fairways hit. Not only equipped for outdoor activities, the Vivoactive 3 works well in the gym, too. With Garmin’s strength tracking feature, it counts reps and sets when using free weights or bodyweight exercises. But what really sets the Vivoactive 3 apart is Garmin Pay. The service (powered by Fit Pay) makes the Vivoactive 3 Garmin’s first watch to offer contactless payments. The Vivoactive 3 comes in three styles: Black with a stainless bezel, black with a slate bezel, and white with a stainless bezel. On the inside, however, the watch’s face, widgets, data fields, and apps can be endlessly personalized thanks to the Vivofit 3’s compatibility with Garmin’s Connect IQ store. In today’s connected culture we’re all pros at pairing Bluetooth devices with smartphones but this hasn’t stopped Garmin from continually improving its Connect Mobile smartphone app to make the process easier. After turning the Vivoactive 3 on (by pressing the side button) we were directed to choose a language and then download Connect mobile to create an account. The watch found the phone and delivered a 6-digit pairing number. 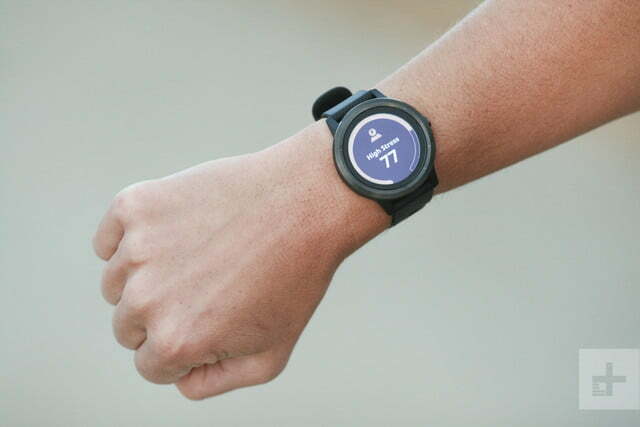 Once paired, Garmin Connect Mobile made sure we understood how the Vivoactive 3’s basic functions work by walking us through a touchscreen swiping prep course illustrated with animated graphics. With only one button and a touchscreen, moving through the menus on the Vivoactive 3 requires a symphony of swipes, taps, and presses. Swiping up or down scrolls through the Vivoactive 3’s widgets. Tapping a widget screen leads deeper into the data and going back requires a swipe right. Those who prefer swiping left can switch that in the settings. It’s also possible to flip the watch’s orientation so the button is on the left side. With Garmin’s quick connect watch band, moving the buckle to the proper orientation only takes roughly 10 seconds. While getting around on the watch, we were surprised to find that settings could be accessed from different menus. A long tap on the screen brings up the settings menus (with a battery level graphic at the top), while a long press of the button delivers the fully customizable Controls Menu with the battery level graphic in the middle of the screen. Additionally, backlight brightness could be accessed from either the controls menu or the settings menu. 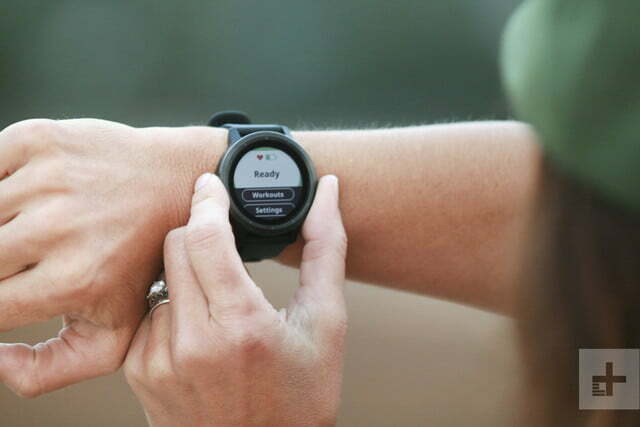 Overall control of the watch’s alarms, display backlight, personal info, goals, heart rate zones, and controls menu are easily edited on the Garmin Connect website, however, editing data fields — or customizing new watch faces or apps — must be done on the watch. We wanted to rearrange the order of our apps (so bike would be first, for instance) and it turned out we could adjust it on the watch, on the website, or on the Connect Mobile app. Figuring out where to best adjust each of the watch’s features does take a bit time. The Vivoactive 3 tracks a load of activities and while we’d love to think that we’re out there doing each one all the time, for us, it really came down to biking, walking, swimming, and an occasional workout. First thing we tried was the bike ride function. We pressed the button once, chose the bike app, and waited roughly 20 seconds for the watch to line up the GPS satellites before we took off. The interface looked so similar to the Fenix 5X that we wrongly assumed all the options would be similar, as well. However, they weren’t. Moving through menus requires a symphony of swipes, taps, and presses. One of our favorite cycling metrics is percent grade — who doesn’t love keeping track of how gnarly their climbing is? While we could set a data field for total ascent, there wasn’t an option for percent grade. The Vivoactive would pair with our ANT+ heart rate monitor chest strap and our cadence sensor no problem, however, it won’t connect to a power meter (even though it has the technology). We realized the Vivoactive 3 has a much narrower set of options than the Forerunner 935 or Fenix 5 simply because of where it lives in Garmin’s GPS watch ecosystem. Now that many of its watches have the same tech inside, Garmin is differentiating its products by features and price. While we’d like to see every feature on every watch, the reality is that those who want more have to pay for it. Being able to check 24-hour heart rates with the swipe of a finger is great and seeing a visual representation of current stress levels is entertaining, however, our time with the Vivoactive 3 was not entirely trouble free. One was no biggie but the other was very much a deal breaker. The first was when we got the Vivoactive 3 wet as Garmin’s new touchscreens are very touchy when in the water. Taking a shower or swimming often sent the Vivoactive 3 off on an auto-pilot tour of apps and settings. Yes, the watch has a touchscreen lock that is a long press of the button and a tap on the screen away but it isn’t something we want to do each time we jump in the shower. We worried something similar would happen when we used the Vivoactive 3 to track lap swimming but Garmin’s engineers were ahead of us. In swim activity mode the touch screen automatically locks. During a swim the only way to interact with the watch is through the button. Smart right? The Vivoactive 3’s vibration alert is one of the weakest we’ve ever encountered. Then comes the deal breaker. We rely on silent smart notifications and alarms to guide us through our daily life. We depend on the vibrations to tickle us awake each morning, remind us when to pick up the kids, and let us know our phone is ringing without screaming it out to everyone else in the room. Unfortunately, the Vivoactive 3’s vibration alert is one of the weakest we’ve ever encountered. Even set to “high,” the vibration alert repeatedly failed to wake us up, alert us to a text, or get our attention when a call was coming in. In our time with the Vivoactive 3, we missed nearly every vibration alert the watch delivered. It got to the point where we switched back to wearing Garmin’s Vivosport at night, simply because we knew we could trust it to vibrate enough to wake us up in the morning. It’s a bummer that a watch with so many positives could fall so short when it comes to notification alerts. The vivoactive 3 is a powerful, small, midrange GPS multisport watch that also acts as a digital wallet. The color LCD touch screen is bright, crisp, and easy to read. The preset activity tracking and indoor workout recording worked exactly as we expected and checking our stress levels during the day was always entertaining. Sadly, the weak vibration alert keeps it off our wrist. 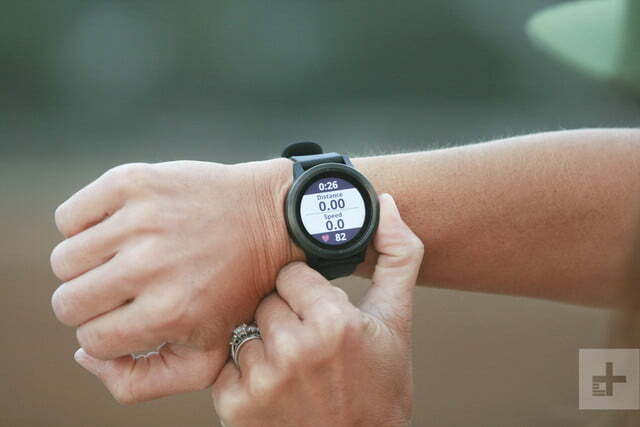 In our opinion, Garmin leads the wrist based fitness tracking game. The Vivoactive 3 fits right into the gap between fitness bands like the Vivosport and big, burly GPS multisport watches like the Fenix 5X. Those who don’t need the features of Garmin’s $700 flagship multisport Fenix 5X but want a little more than what a Vivo fitness band offers will find great value in the $330 Vivoactive 3. 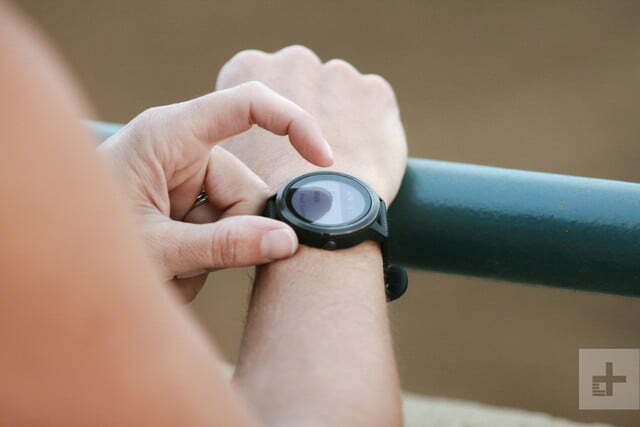 The Vivoactive 3 is a full-featured GPS multisport watch with the sensors to match. There is no reason to be worried about it becoming obsolete any time soon. Garmin continually updates its system software adding fixes and new features along the way. We would be surprised if we didn’t see features trickling down from the Fenix 5 to the Vivoactive 3 in the coming year. As a Fenix 5 junior, the Vivoactive 3 is a great value. It’s also the only Garmin watch to offer Garmin Pay. 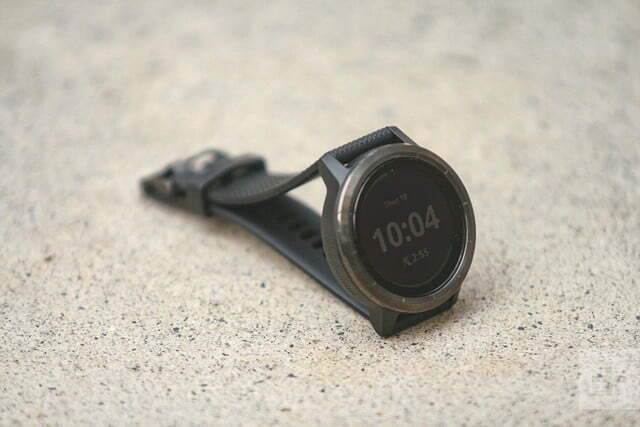 If you’d like a digital wallet on your wrist and can live with an almost imperceptible vibration alert, then the Vivoactive 3 nearly offers a Fenix 5 experience at close to half the price. If vibration alerts are more important than connected sensors and Garmin Pay, then we’d suggest saving $130 and buying the Garmin Vivosport instead.